If these are anything like the A/T3 tire I would buy them again in a heart beat. Tires wore very good for the type of tread. Very happy with the tires. Purchased a set of HT3 for my 2500 Suburban several month ago. I see no signs of wear on them. They handle good and seem to have good traction. No problems towing trailer with tractor on it. I recommend them. Can not report on snow here in the Florida Panhandle but wet seems fine. These were purchased to replace the Discoverer HT I ran on a Sierra 2500HD. I am very please with the ride and handling of these so far. I have almost 3,000 miles and I am really impressed. The noise is even less than the HT's they replaced. Good wet traction and handling as well. Work well in the snow & ice too. Occasionally pull a trailer with between 3-6,000 lbs. and have had no issues. And considering the higher pressures required on the 2500HD, the ride is very good, along with very minimal noise. Tires get rotated on every oil change, about 5-6,000 miles. I purchased these tires for my 2003 F350 dually King ranch based on my driving conditions of mostly dry/wet roads in the northeast in 2014. The tires performed well but after 14,000 miles the front tire treads are worn to a point that replacement is necessary. Always properly inflated and aligned, I am disappointed these tires could not handle the weight of my 6.0 diesel. The 4 rear tires are in great condition and will serve someone else well. I plan to move to the Discoverer AT/3. Maybe due to advances in design this tire will be a better choice for my vehicle. I upgraded the OEM Goodyear Wrangler SRA's on my Ram 1500 Ecodiesel to this LT tire primarily for towing. We tow a 6,000 lb camper pretty regularly, and the SRAs were almost worn out at 27K miles. So far very happy with the HT3's. Extremely smooth and quiet. Towing is noticeably more stable than the SRA's at the right PSI. On the LT tires, need to do about 55PSI in rear when towing my camper weight. Very pleased with the tires so far, and the tread depth will last substantially longer than the stock goodyears. Went from Michelin with no issues to the Cooper that generated a great deal of wobble, swaying. I now fight to keep the vehicle straight and cringe when encountering wind, rough roads, uneven pavement or passing vehicles. Huge mistake purchasing Cooper. 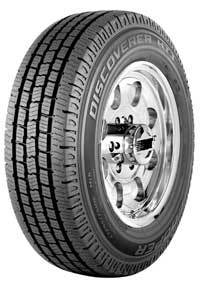 I use these tires on my Dodge 2500 and also on my Montana High Country 5th wheel trailer. We had lots of problems with trailer tires and decided on the cooper tires for the 5th wheel also. So far we have had no problems and excellent results. I use my truck to tow a trailer everyday. I get good wear, traction and durability from the HT3. Bought 4 of these tires in March 2014 and are close to having to be replaced after 23,000 miles. These tires were rotated every other oil change, 6,000 miles. Very displeased with this tire for the reason I stated. Should be credited towards new set. I never drive over 60mph. I bought these tires for my 2006 Chevy dually which I use to pull a horse trailer. The handling is great in all Southern California weather conditions. The ride is smooth and quiet for such a big truck. The truck is mainly driven on pavement but sometimes I drive on dirt or gravel at trail staging areas. My only gripe is that the tires do pick up some gravel but that's a small price to pay for tires that look good and perform well.